Data, what it is and what we do with it, has been a recurrent focus of this blog. We’ve had posts on, ‘What is data?’, the ‘Death of Data’, and ‘Doing Monstrosity: Two conferences, four minutes of free improv and the death of “data”’. Now we’re trying something a little different to develop on these themes and help us all untangle what it is we spend our days collecting, wrestling with and working into semi-coherent representations of the world. Maggie MacLure is opening the Museum of Qualitative Data. 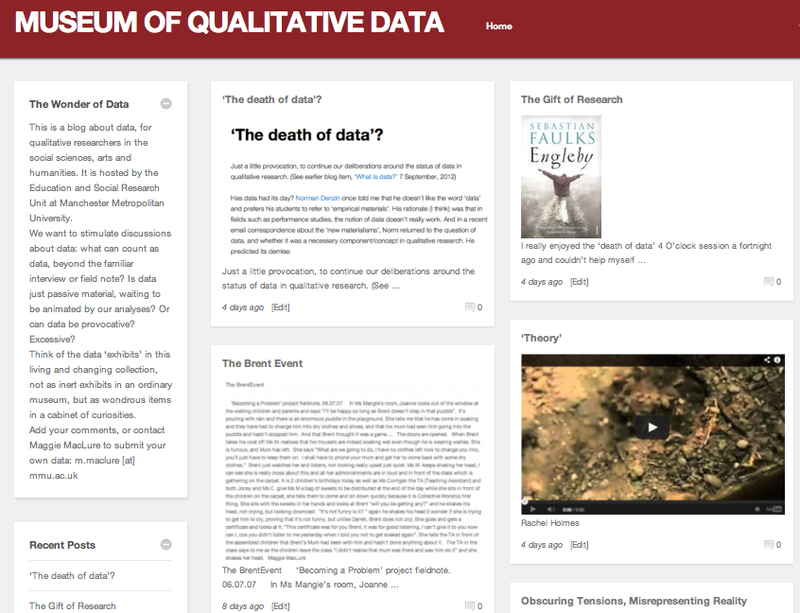 Okay, well actually it’s not a Museum, not yet anyway, it’s a blog but it’s a blog about data, for qualitative researchers in the social sciences, arts and humanities. She wants to stimulate discussions about data: what can count as data, beyond the familiar interview or field note? Is data just passive material, waiting to be animated by our analyses? Or can data be provocative? Excessive? Think of the data ‘exhibits’ in this living and changing collection, not as inert exhibits in an ordinary museum, but as wondrous items in a cabinet of curiosities.